In our quest to meet customer requirements, we have cleaned the cobwebs off our old ETR-1 Event Timing Relay and redesigned it. The result is the new ETR-3 Event Time-Base Relay, which has Standard Solid State switching devices in place of the ETR-1’s mercury-wetted relays. 60Hz line frequency is used as the input and is divided down to one pulse per second or one pulse per minute output. The ETR-3 can be used in two modes, free-running or externally-enabled. In free running (FR) mode, the ETR-3 continuously monitors line frequency and outputs pulse at the pre-determined interval when power is applied. In EE mode, the ETR-3 monitors line frequency and accepts input pulses when the dry-contact enable input is closed. In this manner, the ETR’s can also be used to generate a pulse representing the accumulated ON-time or operating time. This could be used as an elapsed time indicator when used with the SSI PPC-1 pulse counter or other service life counter. Two Form A (2-wire) dry-contact outputs are available. The input and output circuits’ terminal strip are “Euro” type connectors. The K leads of each of the ETR-3’s isolated outputs are fused to prevent damage to the relays under almost any condition a user might subject it to, such as excessive current, voltage, or incorrect wiring. 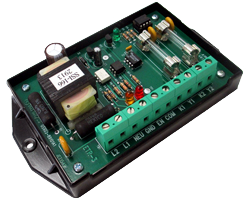 The ETR-3 provides a “pulled up” sense voltage of approximately +13 VDC on the EN terminal input to the output of the external sending contacts. The COM terminal is system ground allowing the use of standard electro-mechanical, dry contact switches or solid-state open-collector transistor or MOS-FET count initiators. The ETR-3 has built-in MOV transient protection for the solid-state relay contacts that eliminates the need for external or off-the-board transient suppressors. All component parts of the ETR-3, which have power applied to them with the exception of the input/output terminal strips and the divider switches, are enclosed in a polycarbonate cover for maximum user protection. The mounting base plate is also made of polycarbonate and offers excellent electrical insulation. Mounting tabs on the base plate allow the ETR-3 to be mounted in an appropriate enclosure for the application and the operating environment.